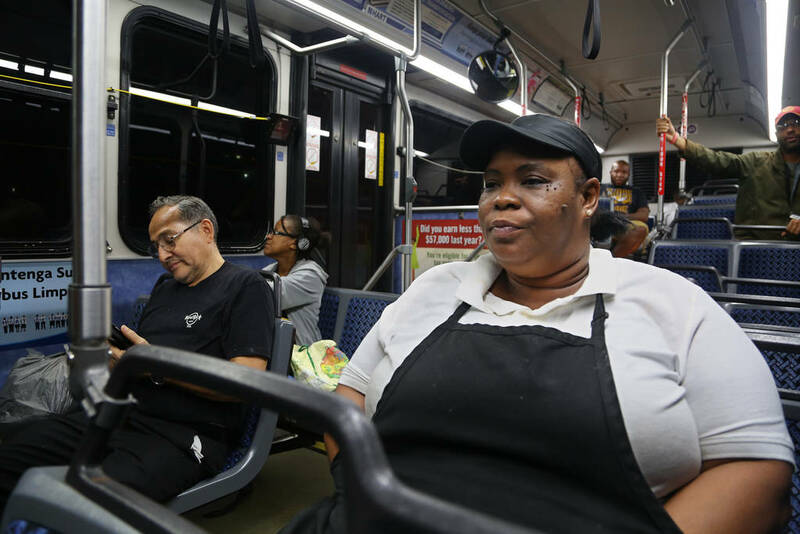 Sabrena Lloyd, 42, spends 30 hours a week commuting from her home north of Fletcher Avenue to her job at Tampa International Airport. If she had a car, it would take her 25 minutes each way. TAMPA — Sabrena Lloyd could drive to her barista job at Tampa International Airport in 25 minutes. But she can’t afford a car, so instead the 42-year-old leaves her two-bedroom apartment north of Fletcher Avenue and catches one bus, then another, then a third, looping miles out of her way. When everything goes perfectly, Lloyd spends five hours a day, six days a week, getting to and from work. If she lived in almost any other big city, she’d be better off. In Tampa Bay, local leaders have debated ways to fix the area’s limited public transportation system for 30 years — then time and again, chosen to do nothing, the Tampa Bay Times has found. Today, the system does far less to get people around than those in virtually every other similar-sized place in America. Out of the country’s 30 largest metro areas, the region ranks 29th in four of six common ways the federal government measures public transit coverage and usage. The other two ways, it ranks dead last. The region is 17th in population. 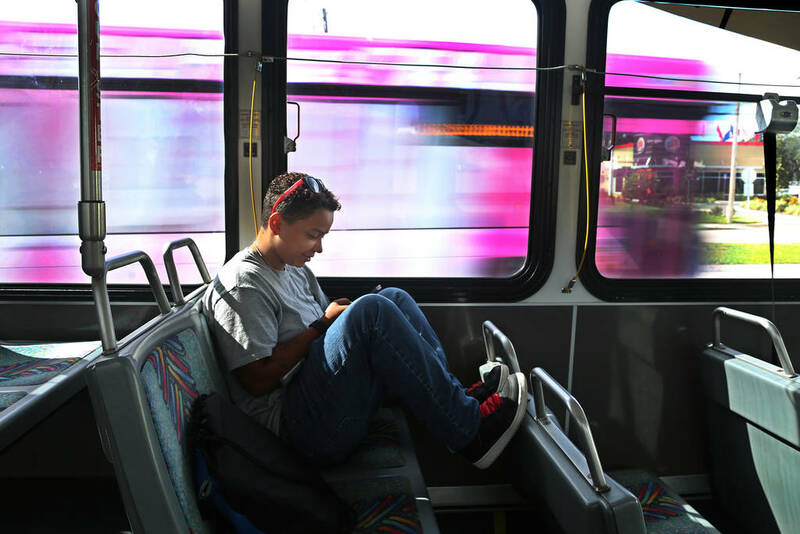 Times reporters analyzed data on more than a dozen different transit metrics; interviewed key local officials, national experts and more than 40 bus riders; and studied similar-sized areas across America. Then they traced local elected officials’ decisions about the topic over three decades. Tampa Bay spends far less on transit each year than any other major metro area. It is the only top-20 metro region to spend less than $213 million annually. Its $141 million operating budget is on par with Bridgeport, Conn., and Buffalo, N.Y., each of which have 1.5 million fewer people. County leaders in Hillsborough and Pinellas have drawn up more than a dozen plans to close the gap — then scrapped almost every one. While action in Tampa Bay stalled, other similar-sized cities began treating their limited public transportation infrastructure as a crisis. Their systems improved while Tampa Bay’s stagnated. 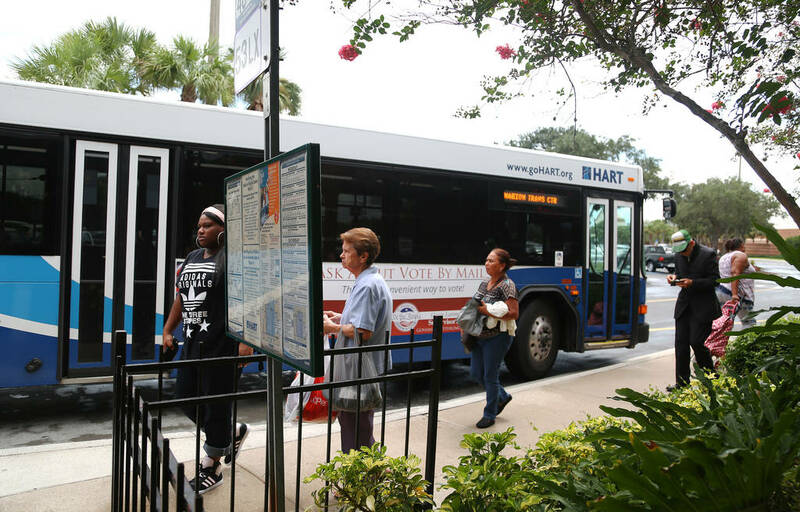 In interviews, the leaders of both Tampa Bay bus agencies acknowledged their systems’ deficiencies, pointing to statistics that show they are cost-efficient with the little money they have. “It’s the difference between good and cheap,” Hillsborough Area Regional Transit Authority CEO Katharine Eagan said. Current and former commissioners in both counties said they need to do more, but also criticized the plans before them — many of which they’d discussed for years and were written under their direction. “I didn’t see a comprehensive plan in place, most especially for mass transit,” said Hillsborough County Commissioner Victor Crist, who voted against Hillsborough’s most recent effort, a proposal to put a transportation tax on the ballot last year. In other American cities, public transportation helps connect the working poor to jobs, schools, shopping and health care. That social safety net barely exists here — forcing many to plan huge swaths of their lives around the bus schedule. 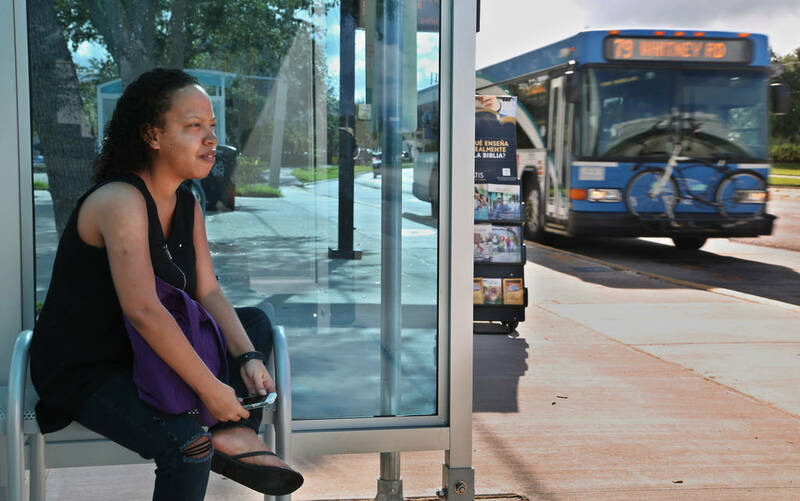 Dionne Sanchez, 21, waits at Tyrone Mall for the second bus she needs to get to class at St. Pete College. Tampa Bay’s transportation system lags behind its peers by almost any metric you pick. Take how well the system connects people to jobs. Tampa Bay’s system reaches the same number of jobs as those in places like Boise, Idaho, or Chattanooga, Tenn. — except it serves five times as many people. In 2011, the Brookings Institute calculated the number of jobs a typical commuter could reach via bus and rail in every major American city. They found that in Tampa Bay, a 45-minute trip could reach about 29,000 jobs. Only three other communities of at least 2 million people scored so low. Two of them — Orlando and Riverside and San Bernardino in California — both invested in major transit projects since the study, unlike Tampa Bay. 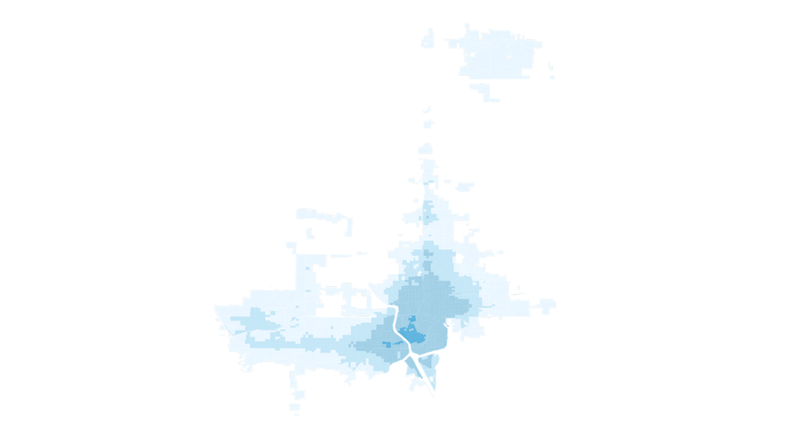 In 2014, the University of Minnesota mapped the number of jobs a bus or train rider could reach in just 30 minutes. 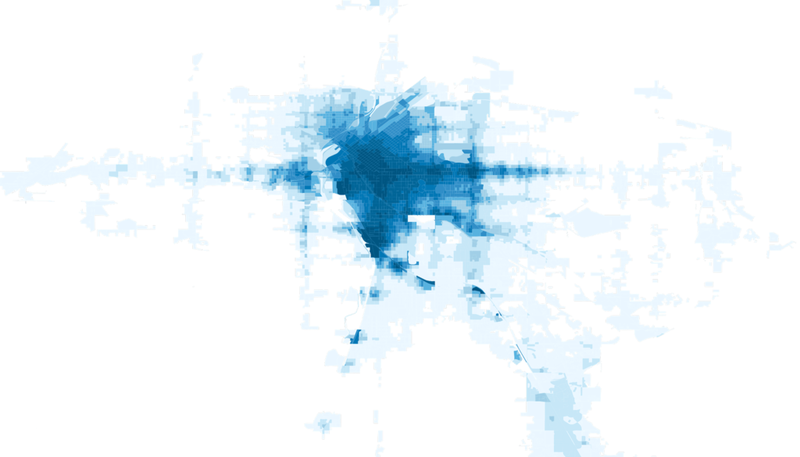 These maps show how many jobs you can reach via public transit from different places in various cities. The darker the blue, the more jobs you can reach. All of these cities have about the same population as Tampa Bay. And here’s Pinellas, Florida’s most densely populated county — so faint you can hardly see it. Job statistics are only one indicator of how little the system does. Almost every other top-20 metro area has at least 600 buses. Tampa Bay has the fewest, about 360. San Diego and Minneapolis/St. Paul are roughly the same size as Tampa Bay, but each had at least three times the ridership in 2015. Spending per capita is half of San Antonio’s, a third of Denver’s and a quarter of Pittsburgh’s. At $57 per person, it’s comparable to Sheboygan, Wisc., and Macon, Ga. This isn’t just because Tampa Bay is the only system without a rail line. Denver, Pittsburgh and Baltimore spend twice as much on bus alone as Tampa Bay, despite being similar sizes. Austin and Milwaukee each have a million fewer people and spend $10 million to $20 million more a year on bus service. And it’s not that Hillsborough and Pinellas trail behind only because they’re two counties separated by a huge body of water. Each ranks poorly on its own. Hillsborough spends $20 million less on buses than the transit agency for Cincinnati, Ohio, and $60 million less than the agency for Detroit, even though both serve similar populations. Pinellas’ agency serves twice as many people as New Orleans’, but both spend about the same amount of money. Transit critics say leaders are smart not to spend more because Tampa Bay is too big and too spread out for transit to ever be successful. But a University of Utah study found that 11 other metro areas, including Minneapolis, Pittsburgh, Dallas, Phoenix and Louisville, Ky., all rank worse than Tampa Bay when combining density, land use and sprawl — and all have transit networks that rank above Tampa Bay’s. Even so, he said, the system is underfunded. Eagan, HART’s CEO, knows her agency is limited. She rattles off the numbers for other cities that dwarf Hillsborough both by the size of their fleets and the money they spend. As for job access? “We are sucky, I think, is a good way to put it,” she said. Still, that leaves little room for Eagan or Pinellas County transit CEO Brad Miller to build systems that work as well as those in other similar metro areas. Miller said he would like to increase service on the Central Avenue Trolley — Pinellas’ most used bus route — to run every 15 minutes. But to do that, he’d have to reduce service on Fourth Street, the county’s second-most-popular route, likely bumping it back to every half hour. It’s 9 p.m., and Lloyd’s barista shift ended two hours ago, but she still has one last bus to catch before she’s home. Her evening commute isn’t any faster than the one to work. She clocks out at 7 p.m. and almost always misses the bus, unable to make it through security and down the escalators in time. The next one won’t come for another half hour. 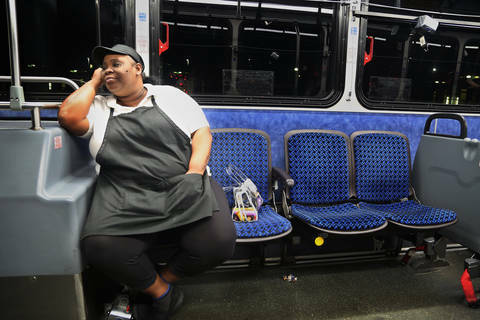 It takes her 30 minutes east to Marion Transit Center, where the second bus she needs pulls away a minute or two before she arrives, like it does almost every day. So she waits another 20 minutes, slowly smoking a cigarette. At home, her 56-year-old mom has been alone for hours. After she lost both legs to diabetes, Medicaid began providing a nurse to watch her while Lloyd is at work. But that doesn’t cover the five to six hours Lloyd spends traveling back and forth every day. Lloyd loves her job, but wishes she could find something closer, or at least a way to pay for the extra care. She tallies up the hours in her head, 30 every week — a full day that she might spend with her mom, use to run errands, or even work a second job. “Instead, it’s just wasted time,” Lloyd said. It surprised her, just how complicated it was to get to one of the region’s most popular destinations. She’s kept it up for 2 ½ years, building an extra 45 minutes into her schedule for the flat tires, the traffic jams, the man who pukes and forces everyone to switch buses. Tonight, she’s stuck waiting outside at the transfer center because another bus is running late. Her feet ache from her eight-hour shift. She hasn’t eaten dinner yet. She yearns for the warmth of a shower as the temperature drops on one of the few cold nights of the year. Finally, the third bus takes her to her final stop. She walks the 10 minutes to her apartment, turns the key and steps inside, 14 hours after she left that morning. Here’s Lloyd’s typical morning bus ride, sped up 1,000 times — and how fast she could get there if she owned a car and were driving herself. Local leaders have known for at least 25 years that the area’s limited transit network makes life difficult for people like Lloyd. Yet more than a dozen plans to expand service or build new transit lines were voted down or ignored. Consider the history in Hillsborough County. In 1991, former County Commissioner Ed Turanchik proposed a multi-county commuter rail system. The plan died after the county couldn’t find a funding source for it. In 1995, a county plan to build light rail and expand bus service qualified for federal money. The county commission later killed its own plan. In 1999, a 99-person committee of residents and transportation experts put together a $1 billion plan to improve roads and expand bus service. The commission rejected it. In 2005, the federal government got tired of waiting for Hillsborough to approve a plan and took the county out of contention for rail dollars. In 2010, the commission took its biggest step toward expanding transit, asking voters to increase the sales tax by 1 penny to expand the bus system and build light rail. But voters shot down the referendum. This isn’t unusual. Across the country, similar ballot initiatives often fail the first time they’re proposed, then pass on subsequent attempts. That’s what happened in Phoenix, Denver and Salt Lake City — all of which now have robust transit systems. But in 2016, Hillsborough County commissioners decided it was too risky to put the question on the ballot again. The initiative would have dedicated almost $1 billion to HART over 30 years, or about $30 million a year. Crist, who took part in three years of meetings to shape the plan, said he did not feel comfortable putting a plan before voters that he didn’t support. He said he didn’t know that HART’s budget was so far behind its peer cities until a Times reporter told him. Hillsborough’s only major transit investments since 1990 have been more about tourism and entertainment than about shortening commutes: The Ybor City street car and the Cross-Bay Ferry pilot, which started in November. The history in Pinellas is similar. Pinellas transportation leaders wrote three transit studies between 1988 and 1998. The plans were never implemented. In the ’90s, commissioners considered building a monorail, then decided it was too expensive. In the 2000s commissioners rejected a plan to raise the gas tax to pay for transit, then returned to a previous idea to add a commuter train on existing rail lines, then rejected that, too. In 2014, for the first time, they put a similar referendum to Hillsborough’s on the ballot. It failed. There has been little action since. “It’s hard to be visionary with transit,” said Steve Seibert, a Pinellas County Commissioner in the the 1990s. Every plan was expensive, served a small segment of the population and would take decades to bear fruit. “We were trying to figure that all out, and in the end, we couldn’t,” he said. Transit advocate Mark Sharpe, a former Hillsborough County commissioner who left office in 2014, grew frustrated watching initiatives die in the county commission board room. Hillsborough County Commissioners listen to residents at a public hearing on a plan to raise the sales tax to fund transportation projects last year. They rejected the plan, 4-3. Not long ago, many car-loving major cities faced the problems Tampa Bay does today. But starting in the ’90s, other regions began making different choices. Denver’s leaders first asked voters to approve a sales tax for transportation in 1997. They voted it down — but local leaders put it back on the ballot seven years later and it passed. When a 12-mile light rail line finally opened in 2013, downtown development boomed. The city now has the 14th highest transit ridership in the country. For decades, Minneapolis and St. Paul also struggled with how to make transit work with two major downtowns. Then Jesse Ventura was elected governor of Minnesota in 1998 and earmarked $60 million for transit projects. The Twin Cities opened a light-rail line in 2004 and began expanding bus service. Ridership grew nearly 50 percent over the next decade, from 67 million to nearly 100 million. Tampa Bay’s has leveled off at 31 million. But perhaps no other city so closely paralleled Tampa Bay as Phoenix — or more clearly demonstrates how things might have been different here. Phoenix and Tampa Bay faced many of the same challenges in the mid ’90s. Both Arizona and Florida are small-government states with limited transit funding. Both struggle with car cultures and swaths of sprawl, though Phoenix’s is much worse, ranking 14 spots behind Tampa Bay in density among the top 50 metro areas. In 1995, Phoenix’s bus system ranked 24th in ridership nationwide. Tampa Bay was 28th. Over the next decade, both regions developed and voted on plans to substantially expand bus routes and to build light rail. Then Phoenix’s passed, and Tampa Bay’s didn’t. Phoenix’s first 20-mile light rail line opened in 2008. Within eight years, the system expanded six miles and plans were made to open two more spurs and launch a modern streetcar. Ridership reached 54,000 weekday riders by April 2016 — a number it wasn’t projected to hit until 2020 or after. By 2014, Phoenix’s bus ridership rose to 18th in the nation. Tampa Bay’s hardly moved, bumping up two spots to 26. Brandon Town Center Mall is a busy transfer center for those trying to get from the outskirts of Hillsborough to downtown Tampa. Most routes aren’t direct and require passengers to take two or three buses to reach their destinations. The question for many isn’t whether more money would improve transit service, but whether transit in Tampa Bay is worth investing in at all. 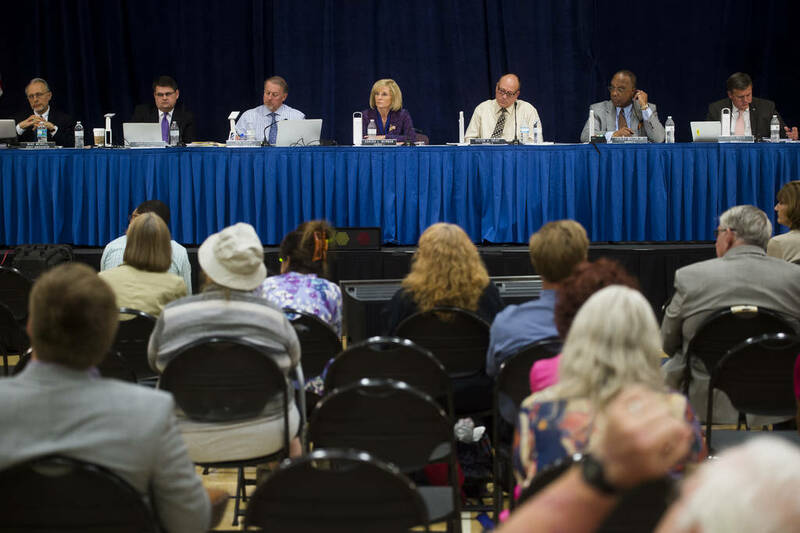 When the Hillsborough County Commission discussed raising the sales tax, it heard from angry constituents who opposed both light rail and higher taxes. HART’s own vice chair, Jaroch, doesn’t believe tax dollars should be spent on major transit projects such as rail and dedicated bus lanes. Hillsborough County Tea Party co-founder Sharon Calvert said the county shouldn’t raise taxes to pay for something that many people won’t use. Polzin, the former HART board member, said the the cost and time it takes to open a rail system complicates the decision, especially when autonomous vehicles might reduce traffic and eliminate the need to own a car. An obsession with building light rail has gotten in the way of making incremental improvements to the bus system, he added. “We keep doing this all-or-nothing strategy with funding, and we’ve ended up with nothing,” Polzin said. Raymond James Financial’s chairman Tom James said Tampa Bay's lack of reliable transit has made it harder to recruit young talent to the region, especially millennials who are eager to ditch their vehicles. But the biggest impact, experts say, is on people who use the system already because they have no other choice. A Harvard study found that access to quality transportation is one of the single strongest factors in whether someone can escape poverty — even more than crime rates or elementary school test scores. The longer your commute takes, the less likely you are to move up the income ladder. The study tracks where it’s easiest to escape poverty. In 2015, it ranked Hillsborough County 98th out of the 100 largest counties in the U.S.
Samantha Sheffield, 19, wonders how her life would be different if she didn’t have to spend 25 hours a week commuting from downtown St. Petersburg to her job at a call center in Largo. Samantha Sheffield, 19, waits for her bus to pull away from Tyrone Square Mall. She could take a part time job — maybe buy a car, or afford an apartment of her own. She daydreams of evenings without 2.5 hours on the bus, full of luxuries like meeting up with friends or reading or working out. Her shift ends at 6:30 p.m., but she doesn’t normally get home until 9 p.m.
Staff writer Anthony Cormier, news researcher John Martin and digital designer Martin Frobisher contributed to this report. Contact Caitlin Johnston at [email protected] or (727) 893-8779. Follow @cljohnst. Contact Eli Zhang at [email protected]. Follow @elizhangnyc. We built a Lego model to show what went wrong with a major transportation project. 24 charts that show how five schools became some of the worst in the state.